How to treat plantar fasciitis (heel pain) in Singapore? Plantar fasciitis is a very common kind of repetitive strain injury that can become chronic if left untreated. This condition is usually misunderstood and poorly treated by the medical community that usually recommend anti-inflammatory drugs, steroid injections, or even surgery as the only options. Instead of trying to get rid of the symptoms, it is wiser to first try and understand the root causes or risk factors of plantar fasciitis and act on these to get rid of the problem permanently.In this article we're going to let you know what it is, what you can do about it and the little known fact (even by podiatrists) about why it occurs. The plantar fascia is a thick band of connective tissue that runs across the bottom of the foot, heel and finally to the toes, in extension of the Achilles tendon. It functions like the string of a bow, holding the shape of the arch of the foot and acting as a shock absorber when you walk. But every time you take a step, the “bow string” stretches. And if, for various reasons that we’ll look at below, this tissue gets stretched too hard and repeatedly, small tears can arise, causing the fascia to become inflamed and damaged overtime. An overstretched or tight tissue will have limited blood flow, restricting the supply of nutrients and oxygen (the building blocks of tissues and muscles) as well as causing an accumulation of metabolic waste than can not be cleared by blood circulation. This build-up of waste will lead to tissue damage or erosion in this specific area, with little to no repair possible. Symptoms of plantar fasciitis include sharp pain at the bottom of the heel, but some people may experience pain at the bottom of the mid-foot area. The pain is usually worse when taking the first steps out of bed in the morning or if you wake up in the middle of the night. The reason being because during the evening, particularly between the hours of 10pm and 2am, the body goes into physical repair mode and the plantar fasciitis will have new tissue and be very soft and tender. Leaping out of bed onto a a hard floor (to go for a pee in the middle of the night) will cause this tissue to tear. This can also occur, to a lesser extent, after a long period of lying down or sitting for an extended period. Having either flat feet or having a high arch: as previously mentioned, the plantar fascia functions like the string of a bow. It needs to be springy enough to support the arch of the foot and absorb the shocks as you walk. 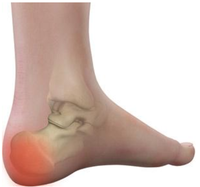 Now, if you have flat feet, the fascia will be overstretched and likely cause an excessive strain on the tissue. On the other hand, if it is not springy enough, the fascia won’t be able to absorb the shocks, adding stress to the tissue. The arch needs to flex and stretch but in the right amount, not too much or too little. Being overweight or being pregnant: the added weight will dramatically increase the pressure and impact on the bottom of the foot during daily activities like walking or standing. This could also lead to the flattening of the feet which sends us back to our first point. Wearing the wrong shoes: wearing shoes like flip flops, or high heels, can contribute to the development of an abnormal gait pattern, modifying the weight distribution in the foot, and increasing the likelihood of strain on the fascia. Wearing flip flops occasionally to go to the beach or around swimming pools or gym locker rooms is fine, but wearing them everyday can cause or exacerbate foot, knee and even low back issues. On the contrary, wearing high heels is equally detrimental. It will overstretch the bottom of the foot, and will contribute to tightness in the calves and Achilles tendon, pulling your heel up and creating additional tension on the fascia. Overuse or over training: occupations that require walking or standing long hours on hard surfaces, such as waiters or cashiers, increase the likelihood of plantar fascia injuries. 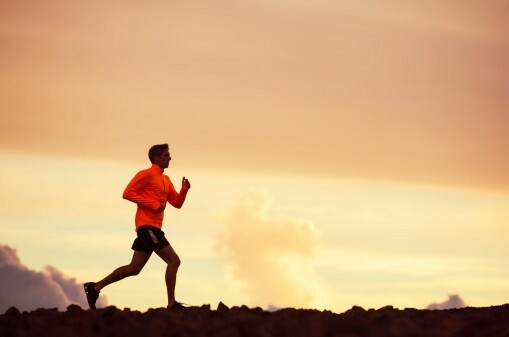 Excessive athletic activity will also increase the stress placed on the foot. 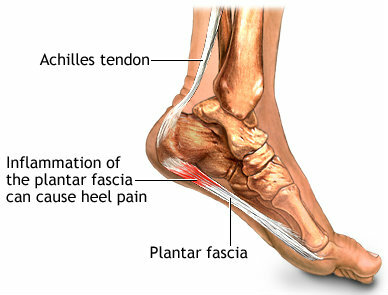 Runners, boxers or dancers are more predisposed to plantar fasciitis. Postural issues compromise stability, mobility and flexibility and create added stress on the body, leading to a variety of pains and injuries. This is probably one of the most common factors but the least talked about in mainstream circles. Postural issues compromise stability, mobility and flexibility and create added stress on the body, leading to a variety of pains and injuries. If your core musculature lacks strength and coordination, your pelvis will likely rotate forward, creating what we call an anterior pelvic tilt or lordosis with an arched low back. As a result, your lateral hamstring (biceps femoris), will be pulled, making it tighter. And as you can see from the picture on the left, the biceps femoris is connected to and wraps around calf muscles which will then, create tension in the Achilles tendon, pulling the heel up, and making the plantar fascia tight. Now there are a lot of reasons behind a weak core musculature. But one of the main reasons, could be poor lifestyle choices leading to leaky gut and a disfunctioning abdominal wall. 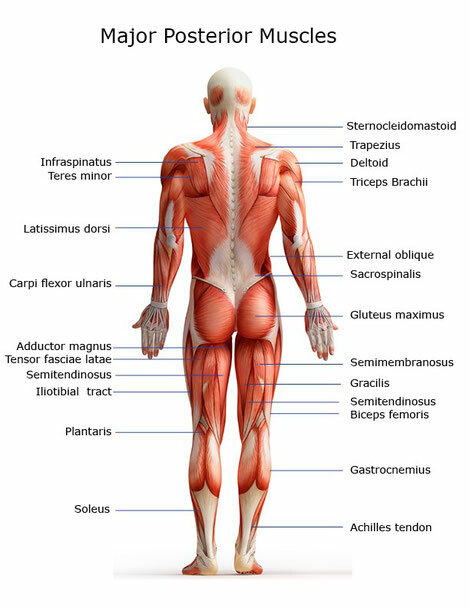 The same innervation is shared between muscles and organs in the same region. So, whenever an organ needs nutrients, oxygen or waste removal it will compete with muscles on the same nerve route. In this case, the organs will always be prioritised at the expense of the muscles, leaving limited blood supply for the muscles. Therefore, if you have an inflamed or damaged gut due to a poor lifestyle (bad diet, stress, lack of sleep…), the blood flow will always be directed to your gut in order to repair it, leaving limited blood for your core muscles. This is a key concept to understand and work on fixing in order to permanently cure plantar faciitis and can require the help of either a corrective exercise coach or a holistic lifesyle coach or both. In the long term, in order to permanently heal your plantar fascia, you first need to address the root causes mentioned above. Change your shoes, avoid heel-stressing activities, fix your gut, heal your organs and strengthen your deep core muscles (and no, crunches are not the solution….). Get adequate rest: the first step would be to stop or at least cut back on the activities that caused it in the first place, such as athletic activities, or standing or walking for extended period of times. Give the tissue the opportunity to heal. Tennis ball massage: the pain is usually really sharp in the morning as you get up because the tissue heals during the night, but the new tissue is very fragile and easy to damage. As soon as you take the first steps, the newly repaired tissue tears, which then creates scar tissue and knots and bumps in the fascia. Massaging the bottom of your foot with a tennis ball in the morning will help break the knots. When you feel a specific painful spot, massage it from right to left (instead of front to back). The best would be to perform this upon waking up and several times during the day, especially before putting on shoes. 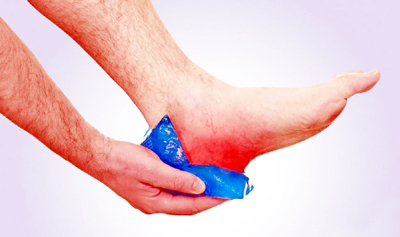 Ice: following the massage, you can place ice covered with a cloth on the bottom of your foot and wait until the irritated area becomes numb for about 15 to 20 minutes. So as you can see there are quite a few issues involved and it's easy to see why specialists, only looking at one area of the body (the feet), can often miss the bigger picture. Stepping back and taking a holistic approach is often the answer to many of the health problems we face in the modern world and it's surprising how much seemingly unrelated physical problems, like plantar faciitis, can be cured by improving diet, employing stress management techniques, getting more sleep and generally working on getting your body back in balance. P.S. If you need advice treating your plantar fasciitis permanently then please feel free to contact us or email us at info@levitise.com.sg and we'd love to help.